Established in 1995, the IAM trucking division, ITC Trucking Ltd, provides airlines and agents with a highly efficient daily air-interline trucking service, linking Irish airports with all major international airports in the UK and mainland Europe. Using a variety of modern satellite controlled vehicle types to suit all cargo requirements, ITC also provides an inbound trucking service. This important value added service provides Irish Agents a vital link regarding the status of their imports whilst at the same time giving client airlines a new business service i.e. chasing sales leads on behalf of airline origin stations. In recent years ITC has expanded its fleet capability and now also provides a variety of specialist trucking options to non-Freight Agent customers too. ITC staff continually feed sales leads to origin stations and jointly canvas exports at point of origin. Operating to exacting airline standards at all times, ITC has an enviable reputation for fast, reliable trucking services between Ireland and the UK daily operating to a nearly perfect 100% trucked as booked record at all times. The ITC operation has grown substantially over the years and now provides trucking services for general cargo and specialised transport requirements. Recent carry requests include complex switchgear movements UK to Ireland, giant aircraft components to assembly factories, highly valuable and transport-sensitive electrical and pharmaceutical products. 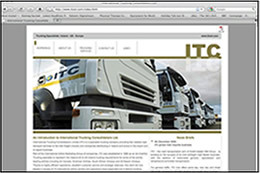 ITC uses a modern fleet of vehicles to meet any requirement e.g. roller bed, box trailers, curtainsiders, tautliners, aero engine carriers, mega trailers, temperature controlled vehicles, large load and other types of specialist dedicated equipment. All vehicles are fitted with the latest high tech monitoring and communication systems to ensure accurate tracking at all times. ITC have developed an initiative with all major import forwarders to procure import traffic into Ireland on behalf of all client airlines whilst at the same time providing a vital local point of contact for Irish based import agents. The ITC import sales team actively target the principles behind regular import freight into Ireland. ITC constantly pre-alert local import agents on all aspects of the movement of their shipments and ensure that forecast delivery schedules are met at all times. CLICK HERE to visit the ITC website for more information.